Hiring a reputed CMS website development company in Delhi NCR is the need of the hour. There aren't many competitors who have created the benchmarks like us in the industry. 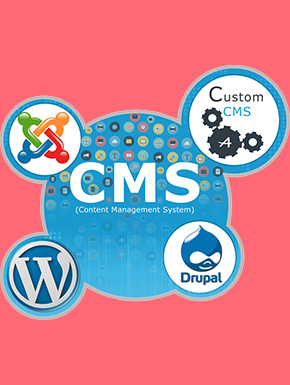 Being among the top CMS Development Companies we have employed a team of experienced CMS web development professionals with expertise in their specific technologies. Hence, you can count on our team for both WordPress web development and CMS of your choice. Hire the Best, Get the Best! Keeping update on all the latest development in their dominions, our team of web developers ensures that every final product you get has the best progressive elements. To put it simply, if you are looking for a reputed CMS Development Company India that offers exceptional returns on your investment meets your short and long-term objectives, you are at the very right place. - You can take control of your website. From blogs to news, events, products, cost; you have complete control on all the features. - You can edit, delete or create new content easily. - You won't need any technical skills to manage content. With an array of CMS web development solutions available in the digital space, which one is the ideal for you? Speak with our experts now. Magento is one of the fastest growing ecommerce platforms that are enterprise level built, tested and supported 24/7. We’ve built an excellent reputation for excellence in Magento ecommerce design and development. Joomla is one of the leading content management systems now and has been used by top established business. Although we specialize in Joomla, we have a very open approach to deal with every project. Word Press is absolutely free. Yes, you heard it right. It is an open sourcing tool and a content management system based on PHP and MySQL. We take pride on being one of the experts in Word Press. Open Cart is a rich designed feature, easy to use and search engine friendly with an appealing user-interface. We are one of the leading companies with a bunch of talented professionals who knows everything about open cart themes. Woo- commerce is one of the most popular Word Press eCommerce plugin. And it’s completely free. With some exceptional features, it can be beautifully integrated into self-hosted Word Press website. Thanks to Presta Shop! It is free software which allows building an online store. It is the best choice to manage different shopping carts with huge range of templates, themes, and catchy designs that brings traffic to your site.